This is a very delayed blog post about the OntoMaton Add-on version we released earlier in the year. But better late than never: here we describe the new features we incorporated in the latest OntoMaton version. 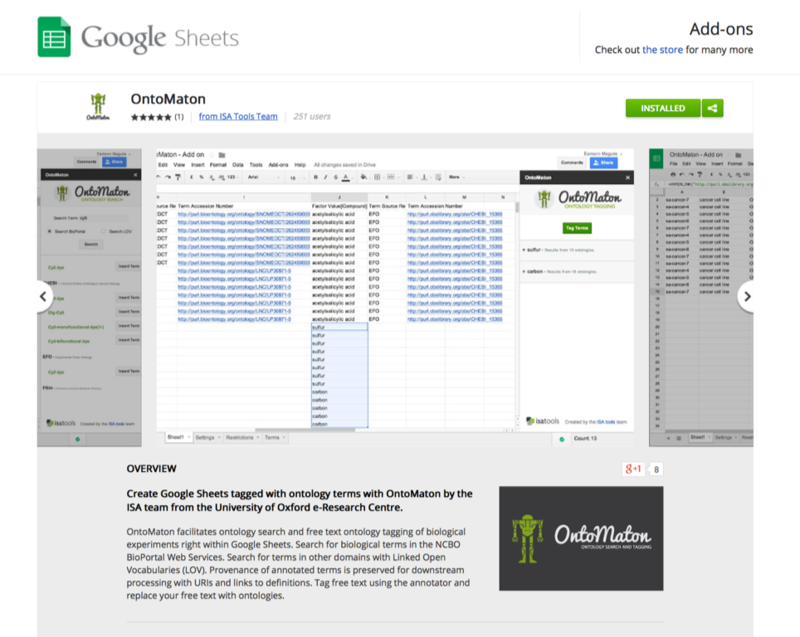 OntoMaton is a widget bringing together ontology lookup and tagging within the collaborative environment provided by Google Spreadsheets. The original motivation for creating OntoMaton was to support users to create well-annotated experimental metadata in biosciences in a collaborative way, while keeping track of different versions. 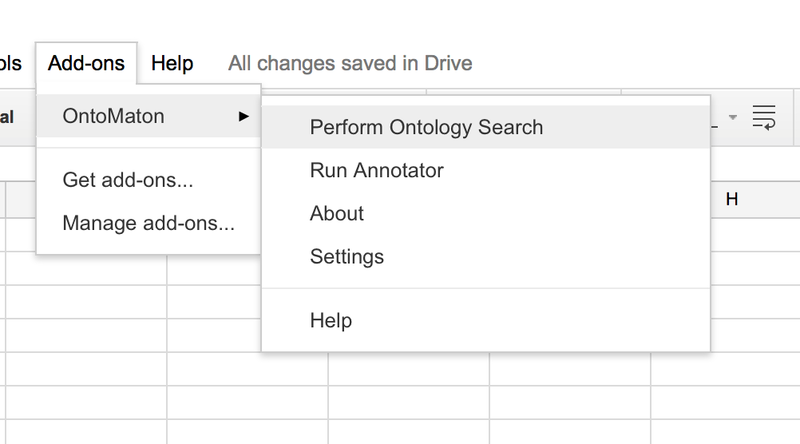 Google Spreadsheets provide such facilities for collaboration and versioning, so we combined them with ontology search and tagging functionality offered by the NCBO BioPortal web services. BioPortal is a web-based repository for biomedical ontologies/terminologies with functionality for searching and visualizing the ontologies and support ontology-based annotations. For more information about OntoMaton and its motiviation, see our publication in Bioinformatics and our previous blog posts. Consequently, we upgraded OntoMaton to the latest versions of these services. We also took the opportunity to incorporate searches across the Linked Open Vocabularies repository. Linked Open Vocabularies (LOV) is a repository of (RDFS or OWL) vocabularies used in the Linked Data Cloud, and thus, not restricted to bio-ontologies. This addition allows OntoMaton to be used for other use cases, relying on vocabularies outside the bio-domain. By clicking on OntoMaton, you can find more information about it, including some screenshots. Then you can install OntoMaton (by clicking over the Free button) or if it is already installed, you can manage the installation by clicking on the Manage button. And that’s it! 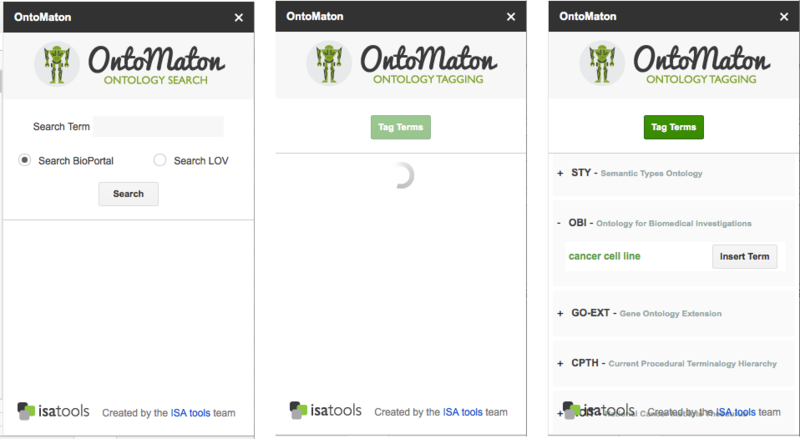 You can start using OntoMaton for searching and tagging… The functionality is as before, except that when searching you need to select if you want to search BioPortal or LOV. If you are interested in the OntoMaton source code, you can find it in its GitHub repository. Finally, if you have questions or comments about OntoMaton, contact us (the ISA team) at isatools <AT> googlegroups.com (replacing <AT> for @!). We would love to hear about how you are using OntoMaton!